It is always an excellent idea to welcome the New Year with delicious homemade savory and sweet dishes. 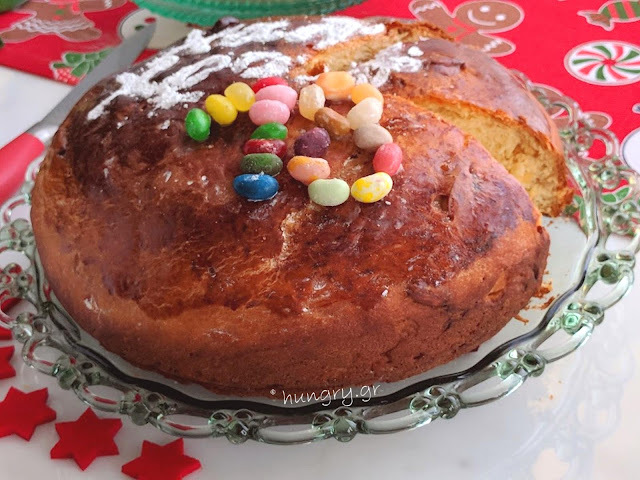 As for the more traditional sweet, Vassilopita, it can be made in various shapes and ingredients for all tastes. 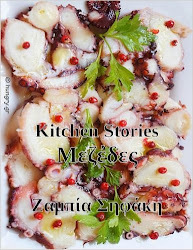 Everything is just as delicious and they belong to the Christmas period of Greece. 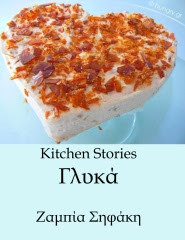 Prepare your Vassilopita sweet or savory - because there is this version in many of our areas - and bake it to beautify the house "feast!". Regardless of the taste you prefer best, do not forget to hide a coin inside! Vassilopita without coin is not done. 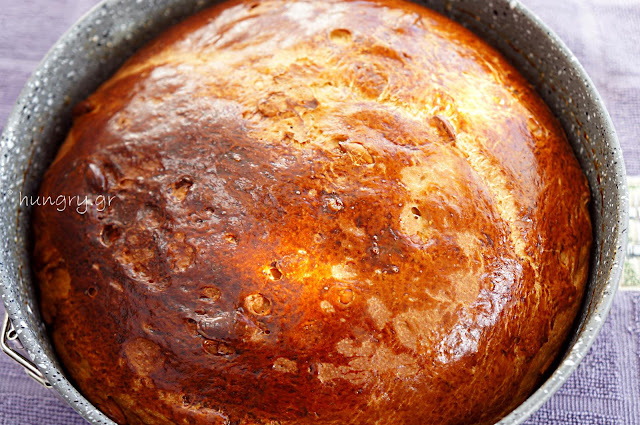 This beloved version of Vassilopita Tsoureki is an easy and light-to-mouth version of traditional brioche. Our own was made with the new olive oil from our own olives, which just arrived at our house from the olive press. He was kneaded in Vassilopita and the satisfaction was great. 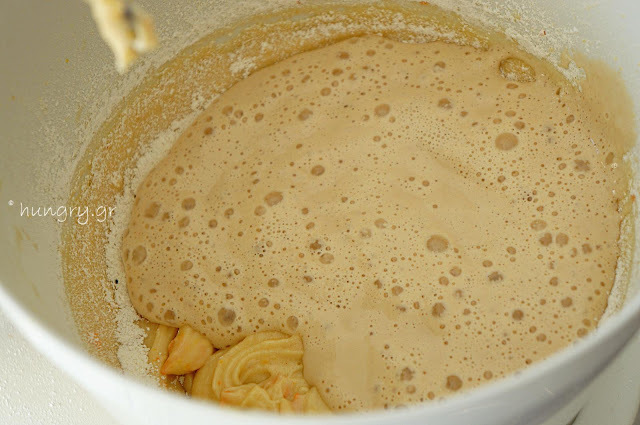 In mid-sized bowl pour the lukewarm water (38-40℃, 100℉) and crumbled with the fingers yeast. 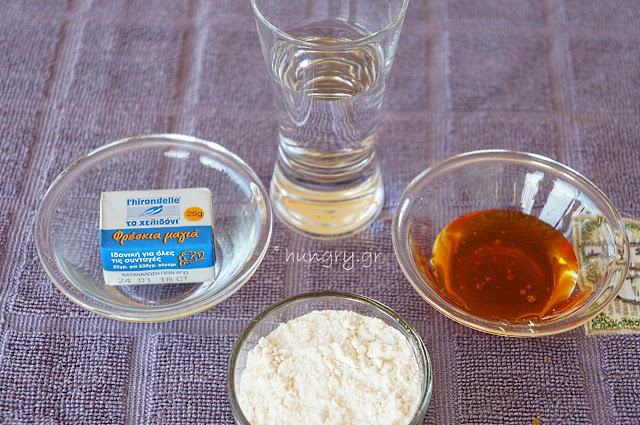 Stir and add the honey to dissolve the flour. Mix well to become a porridge. Cover the bowl with a transparent film and let it warm to inflate for 45'. 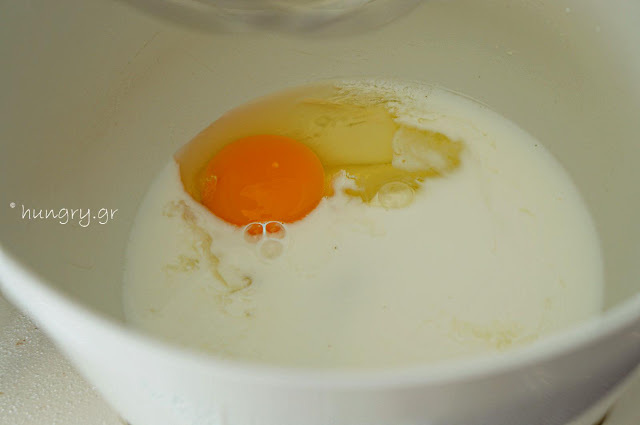 In the mixer bin or in a large bowl, if it is to use your hands, pour the sugar, egg, egg white and lukewarm milk. Beat the sugar for a while. 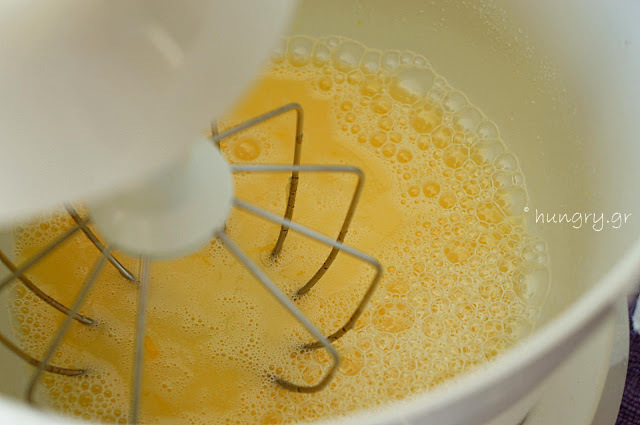 Add by tapping or by hand stirring the orange juice and zest, mastic and flour gradually. 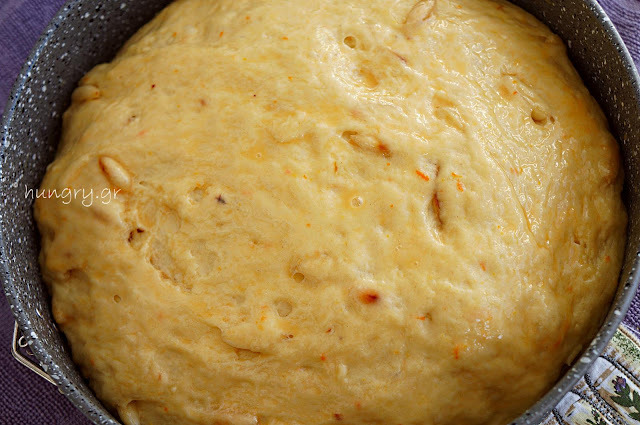 Pour the infused dough and a little more flour and mix. At this stage replace the mixer attachment with the hook. Finish, stirring always with the remaining flour and finally the oil slightly flowing like a yarn. 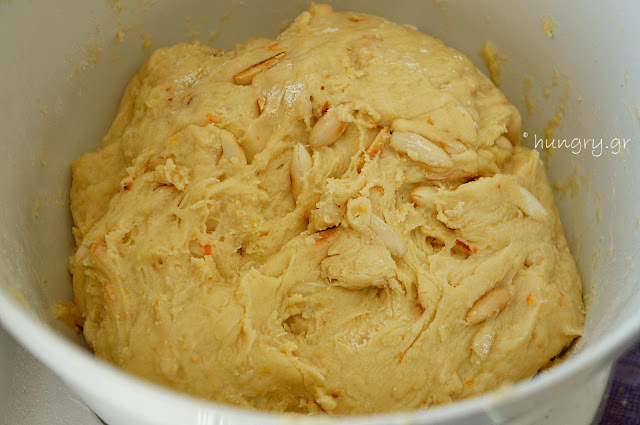 Add the almonds and incorporate them with your hands to go everywhere. 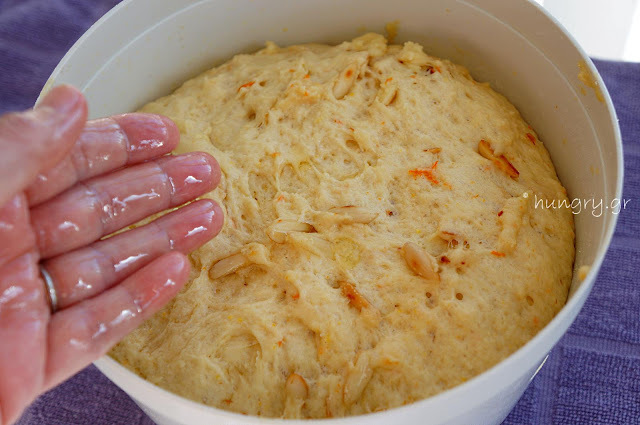 If it hangs in the hands, gently flour your fingers and fold the dough several times. Do not add flour to the mix. Cover with transparent membrane and blanket & leave it warm for 2h:00' without moving it. 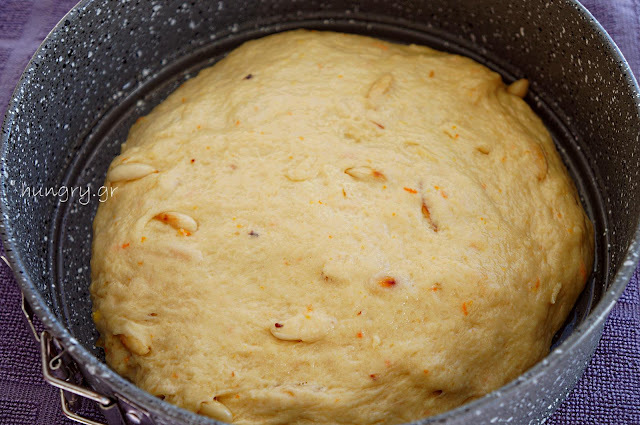 After the 2h:00' the dough will have inflated too much, oil your hands and fold the dough to deflate from the bottom upwards a dozen times. Do not knead. … which is placed in a non-stick form with Ø24cm (Ø9.4in), oiled with detachable sides. 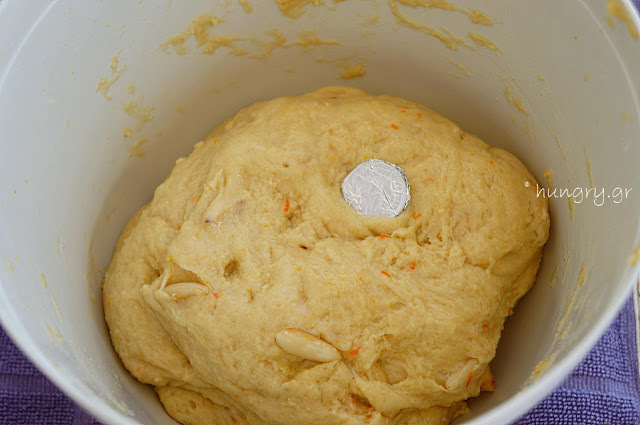 Press the dough gently with your palms to spread a little. Cover it again and let it warm up for 45′. 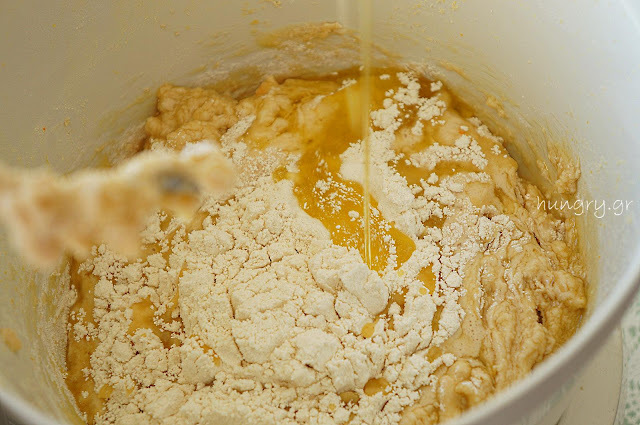 When the dough rises for the second time, we hit the yolk with a couple tbsp milk and carefully grind - to avoid deflating - the surface. 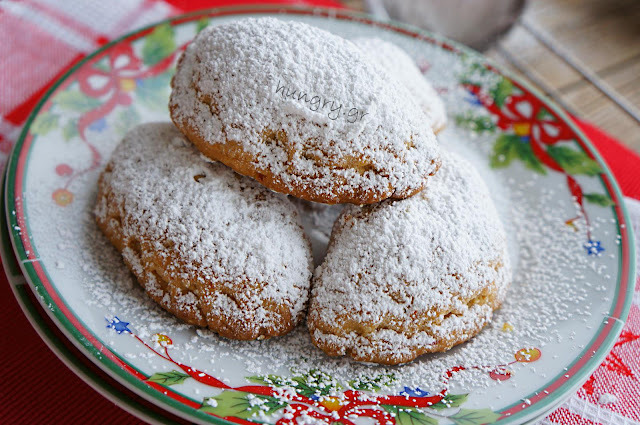 At this stage you sprinkle with what you like or in the end after baking we sprinkle with powdered sugar. Bake in preheated air oven at 170℃ (338℉, Gas Mark:3.5) for 30'-35'. Cook and brown. If you get a quick color, cover it with foil or non-stick paper. Remove it from the oven, let it cool for 15' and then remove the trunk and the base of the form. Let it cool completely on a grill and then adorn it with what you want. 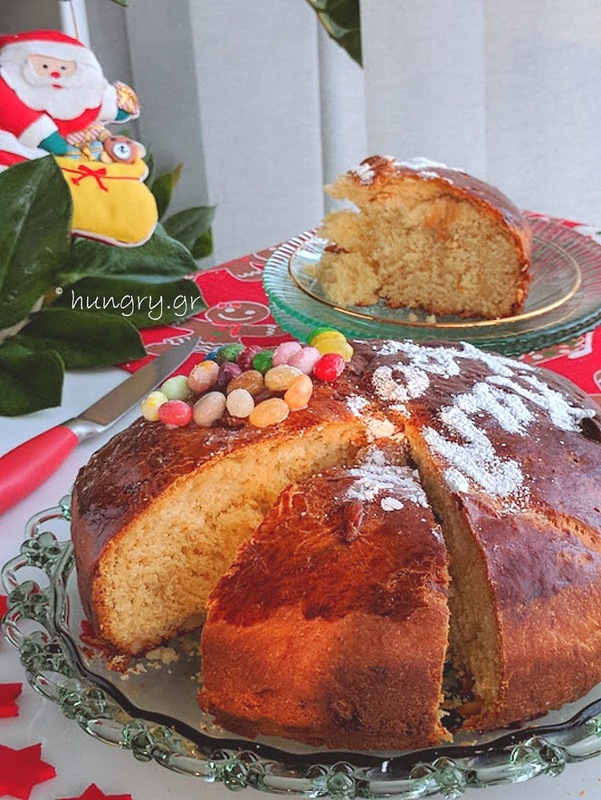 With the amount of sugar we recommend, Vassilopita is unsweetened in order to add sugar to the top, otherwise add 2-3 tablespoons of sugar at the beginning of the kneading. 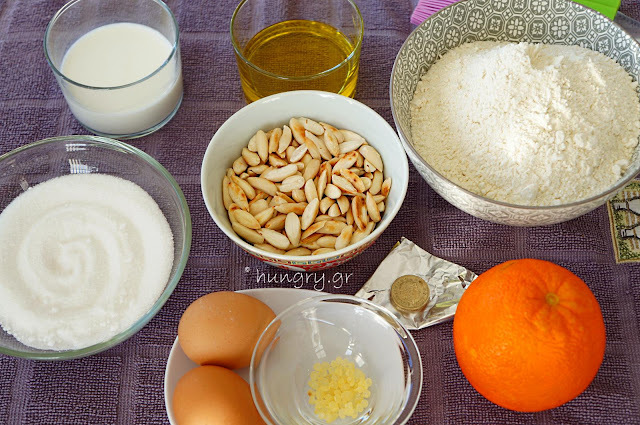 All ingredients to be used for Vassilopita Tsoureki should be out of the refrigerator for at least 1h:00'.